How to Save Text Messages from Android to a PC. 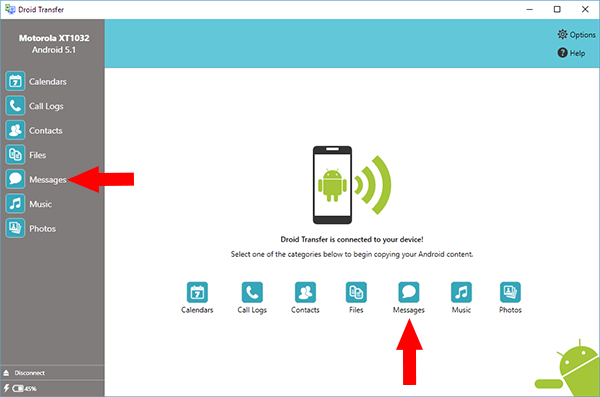 This article provides a quick walkthrough on how to save your Android text message conversations to your PC using the Droid Transfer App. Droid Transfer for PC works alongside the Android app, Transfer Companion, enabling you to save your Android Messages to your PC in various file formats. You can export text messages from Android to PDF, or save text messages as Plain Text or HTML formats. Droid Transfer also lets you print text messages directly to your PC connected printer. Droid Transfer saves all the images, videos and emojis included in your text messages on your Android phone. You can even transfer messages from one Android to another Android! Connect to your Android Device using the steps shown in our Start Guide. Click 'Messages' in the features listed in Droid Transfer. Select the conversations you wish to save from the recipient list in Droid Transfer. 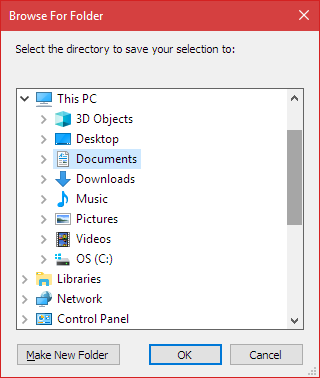 Select the location on your PC where you wish to save your messages. A copy of your selected messages will be saved in a PDF format to your PC. Run Droid Transfer on your PC and connect to your Android Device running Transfer Companion as described in our Setup Guide. How to Save Text Messages Android - In Droid Transfer Click the Messages Icon - Droid Transfer shows the message conversations on the available on your Android Device. Note that the messages displayed are those you've sent and received using your default messaging app on your Android device. If you wish to display message conversation you've had using another app, such as for example Textra SMS, please select this as your default messaging app in your device settings. 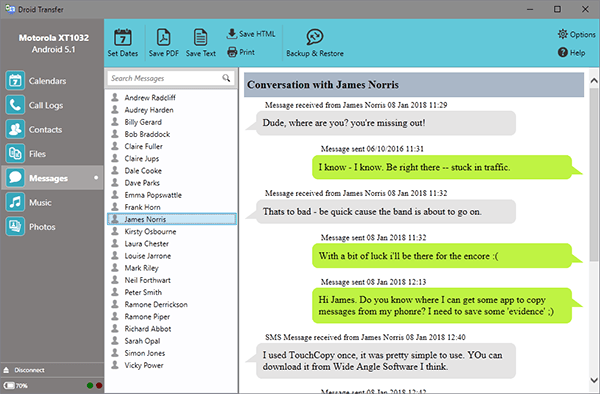 Select the text message conversation you want to save to your PC. Droid Transfer shows all the messages (sent and received) in that conversation, as well as any images and emojis. Click the 'Save PDF' option in the control bar. Droid Transfer copies the text messages from your Android phone and converts them to PDF format. The PDF file is then saved to your PC. Once Droid Transfer has saved your text messages in PDF format to your computer, you can open the PDF document in any PDF document viewer to see all the text messages. And that's how to download text messages Android. Now you have all the tools you need. I hope you found this useful! I updated Transfer Companion to version 3 on Google Play Store. How do I export messages to PDF?